Think of it as Guess Who for the Wii set, or, if you're in mixed company and want to sound smart, maybe Mastermind. Both classic boardgames have you trying to figure out an unknown variable (a person in the case of Guess Who and a "code" in the case of Mastermind) through the process of elimination and deductive reasoning. In Disney Guilty Party, you're trying to figure out the guilty party of one of an endless array of mysteries. On its surface the Wideload Games developed title may sound a bit superficial, easy even. But digging into the game last week with the people behind it, I found Disney Guilty Party to be a pleasantly robust game of reasoning and mystery solving... sans the Great Dane. We talked before about the game's story mode, which has you taking on the role of one of the many members of the Dickens Detective Agency as you travel to a number of settings on the hunt for clues to solve a number of pre-determined mysteries. Disney Guilty Party: Family-Friendly and Fun...Really. 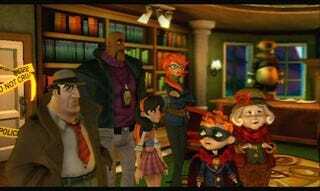 Once you complete and solve those mysteries you unlock the game's party mode, which allows you to play with or against other players in a race to solve new mysteries. As with Disney racer Split/Second, the game seemingly has endless replay value. In the case of Disney Guilty Party that's because the game uses a "mystery engine" (I suggested they redub it the mystery machine, and then laughed heartily as the developers looked on in confusion) to mix together the variables of suspects, situations and story to create new mysteries on the fly. The game, I was told, creates entirely new mysteries with unique plots and characters, not just different endings. And, the developers said, that there are something like millions, perhaps billions, of possible combinations that can come together to create a new story. Wii remote in hand, I took on one of the game makers in a short competitive match of mystery solving. In our case we had to find the train conductor's stolen watch. The game allows you to select to levels of difficulty before you start. One controls the difficulty of the mystery you are solving, the more difficult the more variables like suspects and clues. The other difficulty controls how hard the mini games are to master. There are about 50 mini games in Disney Guilty Party, all of which are used at different times to help your efforts in interrogating a suspect. The game kicks off by selecting who goes first and then handing over a special item token. These tokens can do things like lock a room, preventing another player from accessing it, or turn out the lights, preventing someone from interrogating suspects, or calling a suspect to you. All of this goes into the tactics of deducing and then solving a clue. When it's your turn you select which room in the particular setting you want to go to. Our case took place on a train. I was able to use the Wii remote to survey the rooms, and then zoom in or out to see which suspect I wanted to speak to. Once you start to interrogate a suspect you have to play a minigame. The randomly selected interrogation methods were made up of a fairly simple, sometimes bizarre selection of minigames. For instance, in one I had to smack my remote-holding hand into my other hand in the correct timing to mimic threatening a suspect. In others I had to break eggs, swing a hypnotizing watch or play bad music. If successful the suspect than gives you a clue. The clue's details can be very specific or very broad, depending on the game's setting. For instance, they might tell you the suspect was a man or woman, short or tall, thin or fat. Or they might just say they "saw stripes." When you get the clue you wave your remote-controlled lie detector over it and it shows on screen whether the character is lying to you or not. Because both players can see everything on screen, the developers built in a neat little trick to lie-detection. If you want to, you can hold a button on the remote and it will register the opposite. So, for instance, if the person is lying to you and you hold the button in when you detect, it will say he or she is telling the truth. That's a pretty great idea. Once you get your clue you can flip to a sketch pad where you are able to mark in your clues using a simple selection process, you can also mark red herrings. You take turns playing through the game until you or your opponent think they know who the suspect it, then they have to get to that suspect to accuse the person. This is where some of those ability tokens come in, which can be used to block access to certain people. In accusing a person, you have to not only get it right, but also lay out which clues you used to figure out that they did it. If you're right you win, though the two mysteries I solved ended rather flatly, and without a single mask being pulled off. Played on the easiest setting, Disney Guilty Party feels a lot like the simple children's game Guess Who, as you try to figure out which face matches the clues you're giving. But on its hardest "diabolic" setting, the game jumps right into the Mastermind level of deduction, forcing you to reason out a broad range of clues to deduce who the guilty party is. While I found some of the out of context mini-games a little off-putting, the overall theme and play of the game has me more than a little excited to take it how and see how well it fits into a family game night. Disney loved the concept too. In fact, they loved the Guilty Party game so much it was one of the main impetuses for the publisher to buy the game's developers, Wideload Games told me.